Danny and Nick Blake are brothers. When they were kids and their father had passed out, yet again, from too much drinking, they would sneak out to the meadow and play at being wolves. Down on all fours, they would crawl around, growling and barking at the moon. After the death of their father, the brothers, now estranged, return to the family’s Kawartha Lake cottage to sort through his possessions. Over the course of three days, they must learn to let go of the man they mythologized and accept responsibility for the men they have become. 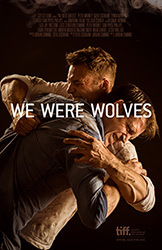 We Were Wolves had its World Premiere at the 2014 Toronto International Film Festival.